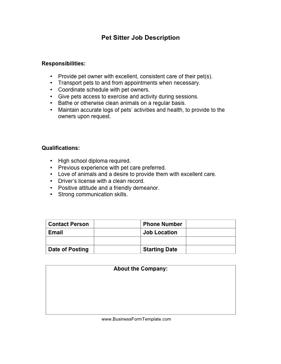 Families and households that are going on vacation or leaving dogs and cats alone for a long time can use this pet sitter job description to hire qualified people for pet sitting. Provide pet owner with excellent, consistent care of their pet(s). Transport pets to and from appointments when necessary. Coordinate schedule with pet owners. Give pets access to exercise and activity during sessions. Bathe or otherwise clean animals on a regular basis. Maintain accurate logs of pets' activities and health, to provide to the owners upon request. Previous experience with pet care preferred. Love of animals and a desire to provide them with excellent care. Driver's license with a clean record. Positive attitude and a friendly demeanor.